Franz Johnston did some of his finest work in the Ontario north. 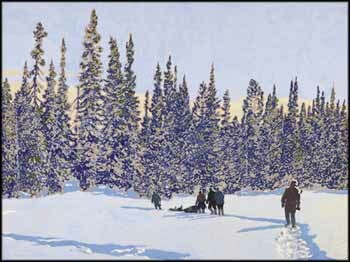 His depictions of winter light, particularly brilliant snowy days such as this, are exquisite. A romance grew up around Johnston's trips to the North, fueled by stories that had the thrill of danger. Roger Burford Mason writes that "numerous stories circulated in the press and among Toronto's artistic community of his being lost in snow, or in impenetrable bush, or being snowed in with diminishing supplies." Such an aura of romance was fitting for Johnston, a former member of the Group of Seven, whose hardy bravado in their quest for painting places was legendary. Johnston was known for his fine abilities with the medium of tempera, used to great effect here. The viewer can feel the crisp air and imagine the crunch of the men's feet in the snow as they march towards the forest, axes in hand, and Johnston's use of icy blues makes the cold more palpable. In Making a Trail to the Woods, Johnston's pure vision of the North puts us under its spell with its elemental grandeur.